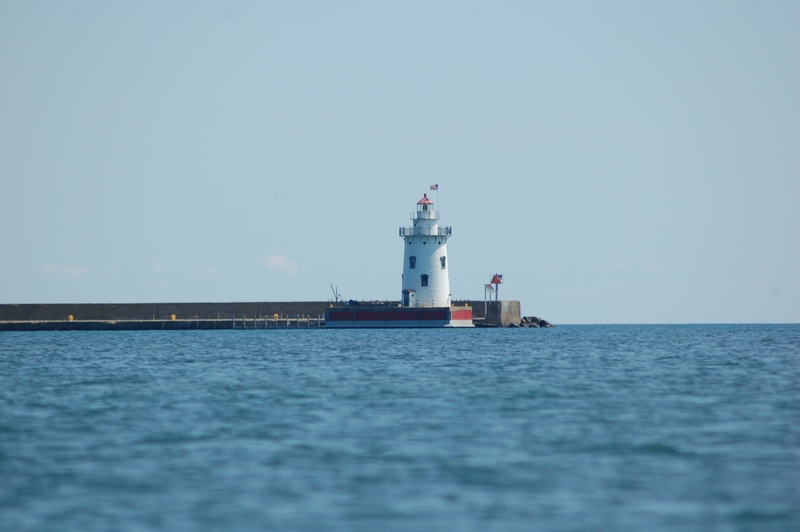 The Harbor Beach Lighthouse sits at the end of a breakwall that separates Lake Huron from the world’s largest man-made freshwater harbor. 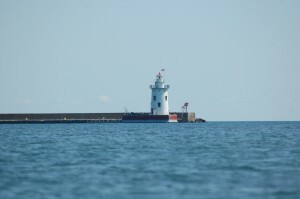 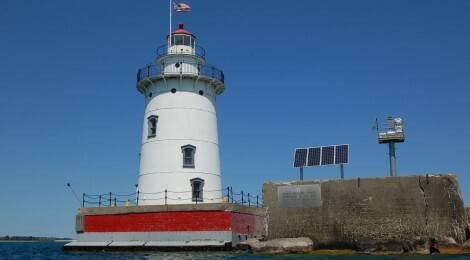 This sparkplug-style light was built in 1885 to replace an earlier structure, and it helped make things easier for boats on Lake Huron by providing a safe refuge between Port Huron and the Saginaw Bay area. 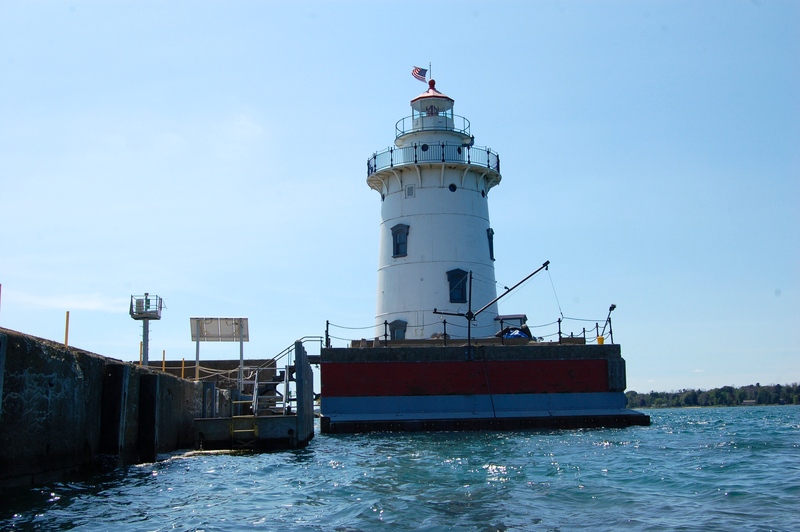 Good views of this Michigan lighthouse can be found at the end of a handicap-accessible fishing pier in Harbor Beach’s Lincoln Park. 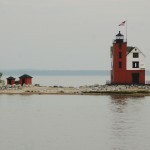 The light is 45 feet tall and is painted white. 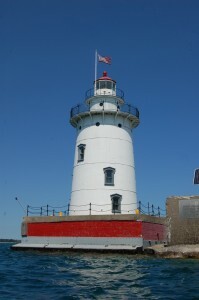 Its lantern room is topped with red paint, which matches the red on the base on which the light rests. 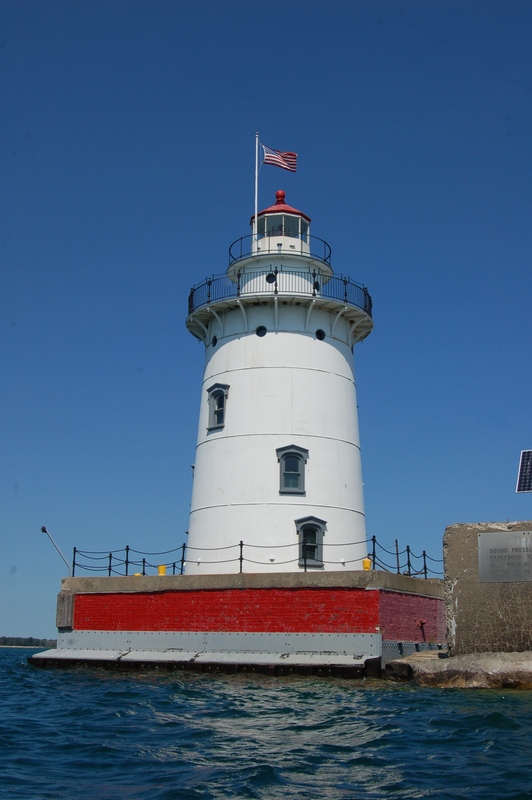 The City of Harbor Beach now owns the lighthouse and conducts tours during summer months. 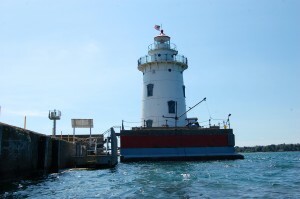 Those tours depart on Saturdays (June 25- Sept. 24) from the Harbor Beach Marina (1 Ritchie Dr.). 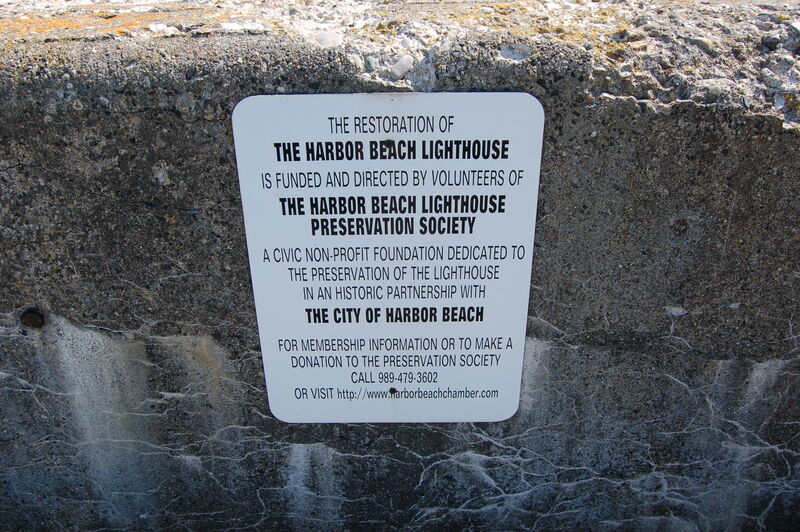 Find out more about tours and ongoing preservation work at https://harborbeachlighthouse.org/. 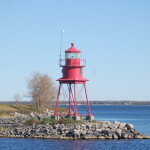 This light was automated in 1968, and today it continues to operate with a solar-powered acrylic lens. 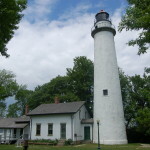 The original Fresnel Lens is on display at the Grice House Museum, which is a few miles north of the park on M-25. 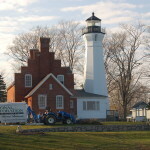 Find out more about the museum, which is part of Huron County’s collection of museums: http://www.thehchs.org/huron_county_historical_museums.htm. To reach this historic lighthouse, take Trescott St. towards the lake from M-25 and follow it to a parking area for the bathing beach and park. 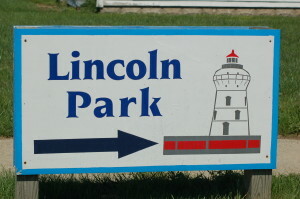 Watch for the sign for Lincoln Park, which features a picture of the lighthouse. We had visited this light several times, but when we returned in August of 2016 we brought kayaks along and made the trip out to the lighthouse for a better view. 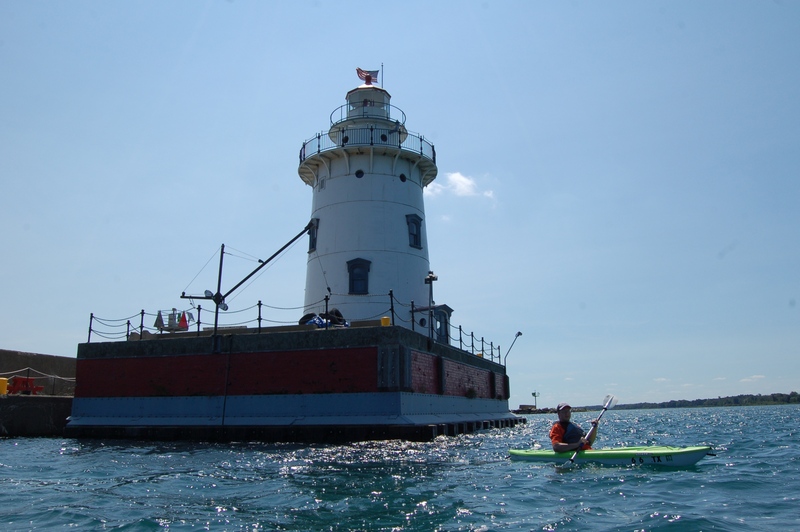 We found the protected harbor fairly smooth and easy to navigate, and it was great to finally get to see the Harbor Beach Lighthouse up close.